soul Archives – Paul DeBlassie III, Ph.D.
There’s a plan going on in our life. We can’t see it day to day, but it’s there. We’re busy living out our stories. Meaning happens once time passes and we look back, we see it all had a purpose. We get into trouble due to anxiety that pops us out of soul. When I treat patients in depth psychotherapy or write visionary fiction, I’m caught by the power of anxiety. With patients, it lures them out of self. It takes them down dark alleys of despair. Characters in visionary stories lapse into waves of overwhelming stress, a toxic situation that clouds their mind and at least temporarily cripples positive behavior. Reading visionary fiction taps us into a realm deeper than our anxieties. We step into another imaginative space and time that offers us a way out of a mental rut. The imagination, as psychologists have explored, opens us up to psychic energies that pop the top of our rule-bound heads off—they get what’s old and worn out and present an invigorating challenge and life-changing revolution. The imagination is the home of the soul. It knows how to take us back inside so we find ourselves again. Dead-end troubles in life, as visionary fiction highlights, often tear us out of what’s true and real. They shake up the good and make us believe there’s only bad. The soul, the source of age-old inner wisdom, knows better. It knows the way back inside. It gets what’s terrible and awful and says voila I have something new for you. It has a plan to get us into the new, the better, the revolutionary. Some say it’s a leap to believe in soul. Actually, there’s no leap. There is no stretch of mind or faith. 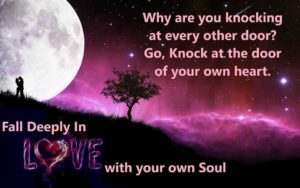 Soul simply is, whether we believe in it or not. Mind-numbing pain jettisons us into a wall that forces a decision to either believe in self or not. That’s soul or soullessness. It’s a plain as a New Mexico sunshine-day reality and depth psychological psychic truth. If you’re up against an emotional/spiritual wall, stop and take a deep breath. Maybe it’s time to get real quiet, do a little online or favorite bookstore search, and read. Go to an imaginative place that speaks to you with a read that offers a tug. There’s a gentle or strong pull to reach out to that bookshelf or click the online button and download. As you start with the first word, sentence and paragraph you’ll feel like you’re settling into a well-worn chair in a warm and comfy home. A soul place. Read and take to heart the visionary story. It will speak to you and show you the way. 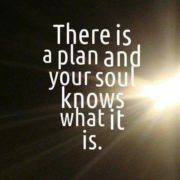 There’s a plan going on in our life, and the soul knows what it is.